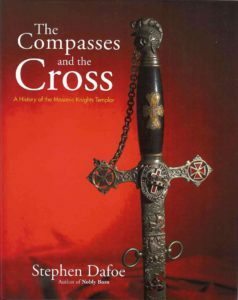 The Knights Templar is so interwoven with Freemasonry that it’s nearly impossible to separate fact from fiction – reality from wishful thinking – legend from assumption. Suffice it to say that, despite the earnest proclamations of many throughout the ages, there is NO PROVABLE CONNECTION between today’s Masonic Knights Templar (or Freemasonry, for that matter) and the Knights Templar organization of the Middle Ages. And thus it is in the murky history of a group which, according to legend, was one of the most powerful in the world at the time. So powerful, in fact, that none other than the Pope ordered them disbanded and, in a few cases, tortured and killed. Did any of it happen? Recent revelations from the Vatican Library have provided tantalizing clues but the history remains murky and without provable provenance. The Masonic Knights Templar (for the US, they’re online at www.knightstemplar.org) has MANY imitators – and, regrettably, some are very far from what Templarism today is. For most of the poseurs, it’s a chance to profit from a fantasy and, like the claims of being ‘the authentic’ Illuminati, it’s nothing more than a hoax. 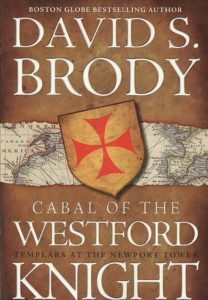 There have been thousands of books to have made the claim that the Knights Templar did this or that. Some say that the Templars escaped and headed to Scotland with their ‘fleet’ yet that supposed fleet was never known before. Some claim that they travelled to the Western Hemisphere and there are stories of treaseure being buried here. As recently as Summer, 2015 our Grand Lodge Library was visited by a Maine resident who said he had permission from the conservatory group which controls an island near Bar Harbor to conduct excavations on an island in the Bar Harbor region where he claims he will soon prove this connection. He was looking for pictures of symbols used by the Knights Templar in the 1500s, well after their ostensible extinction. He claimed to already have them from the 1400s and 1600s…. He promised the Grand Librarian to send copies of what he had – but as you might imagine, nothing has ever been received. As but one example of misinformation and absurdity: Anders Behring Breivik is a Norwegian far-right terrorist who perpetrated the 2011 Norway attacks. On 22 July 2011, he killed eight people by setting off a van bomb in Oslo and then proceeded to shoot 69 others at a summer camp. 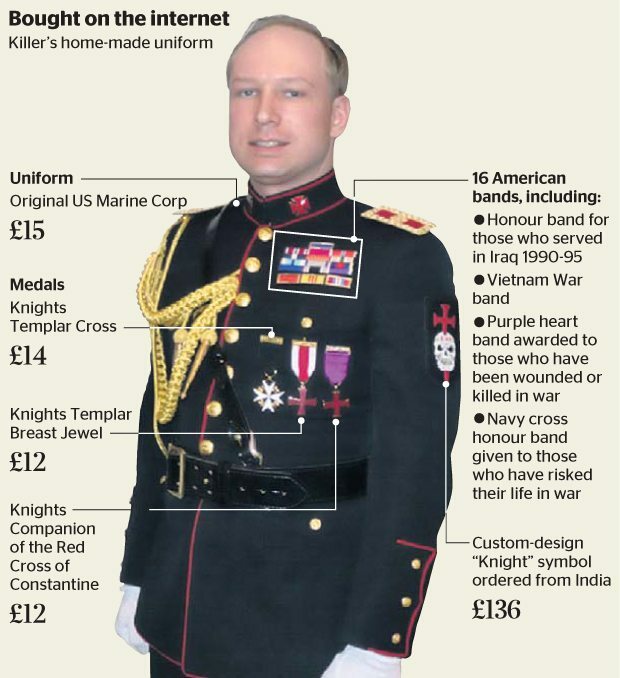 There were frantic internet reports that Breivik was a Mason and a Knights Templar, buttressed by photos showing these memberships. As to the Freemasons, at the time of the attacks, Breivik was a member of the Lodge of St. Olaf at the Three Columns in Oslo and had displayed photographs of himself in partial Masonic regalia on his Facebook profile. [Here][Here] In interviews after the attacks, his lodge stated they had only minimal contact with him, and that when made aware of Breivik’s membership, Grand Master of the Norwegian Order of Freemasons, Ivar A. Skaar, issued an edict immediately excluding him from the fraternity based upon the acts he carried out and the values that appear to have motivated them. According to the Lodge records, Breivik took part in a total of four meetings between his initiation in February 2007 and his exclusion from the order – one each to receive the first, second and third degree, and one other meeting and held no offices or functions within the Lodge.Skaar stated that although Breivik was a member of the Order, his actions show that he is in no way a Mason. In his manifesto and during interrogation, Breivik claimed membership in an “international Christian military order”, which he calls the new Pauperes commilitones Christi Templique Solomonici (PCCTS, Knights Templar). According to Breivik, the order was established as an “anti-Jihad crusader-organisation” that “fights” against “Islamic suppression” in London in April 2002 by nine men: two Englishmen, a Frenchman, a German, a Dutchman, a Greek, a Russian, a Norwegian (apparently Breivik), and a Serb (supposedly the initiator, not present, but represented by Breivik). The compendium gives a “2008 estimate” that there are between 15 and 80 “Justiciar Knights” in Western Europe, and an unknown number of civilian members, and Breivik expects the order to take political and military control of Western Europe. Breivik gives his own code name in the organisation as Sigurd and that of his assigned “mentor” as Richard, after the twelfth-century crusaders and kings Sigurd Jorsalfar of Norway and Richard the Lionheart of England. He calls himself a one-man cell of this organisation, and claims that the group has several other cells in Western countries, including two more in Norway. On 2 August 2011 Breivik offered to provide information about these cells, but on unrealistic preconditions. After an intense investigation assisted internationally by several security agencies, the Norwegian police have not found any evidence that a PCCTS network existed, or that the alleged 2002 London meeting ever took place. The police now view Breivik’s claim as a figment of imagination in light of his schizophrenia diagnosis, and are increasingly confident that he had no accessories. The perpetrator still insists he belongs to an order and that his one-man cell was “activated” by another clandestine cell. On 14 August 2012, several Norwegian politicians and media outlets received an email from someone claiming to be Breivik’s “deputy”, demanding that Breivik be released, and making more threats against Norwegian society. You can see the fabricated uniform that the murderer created, using regalia from the Knights Templar as well as other organizations. This is just one example of the many pseudo fantasies that Freemasonry is expected to account for and justify. Thousands of authors have created contrived stories, repeated myths and lies, and – sometimes – attempted to provide accurate information. However, there is little provable truth and those who claim to have it are generally deluding themselves (and others as well). Sometimes normal explanations don’t fit – and it’s then that things get really ‘wonky’. 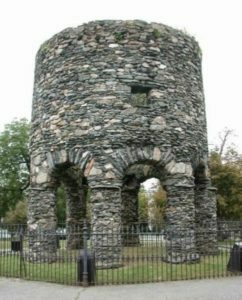 Above is the Newport Tower, in Newport, Rhode Island, which some claim was built by the Templars before Columbus came to America. And, of course, the Masons are always somehow a part of this stuff!